First I want to say thank you for entering my Peanut Butter Lovers Pack Giveaway, sharing my link and posting your recipes. The contest is open until Sunday. I saw some recipes I am for sure going to make. Yum! I love all this peanut butter goodness. I picked up some Peanut Butter goodies today for the winner of the giveaway. So don’t forget to enter. Now to today’s recipe. This is a quick and easy one, perfect for a Friday night! 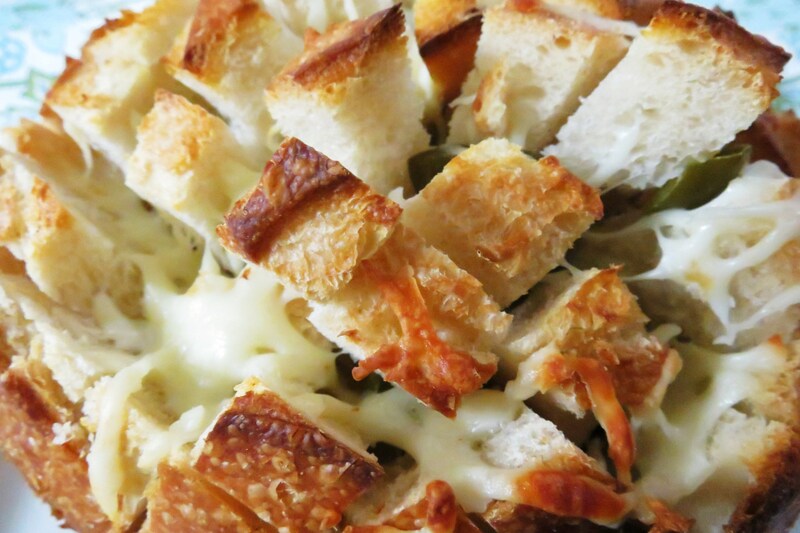 It’s 3 ingredients, easy to make and it is so good my Husband and I demolished it in minutes. I was at Trader Joe’s, shut up, I know what your thinking,so don’t even say it. 🙂 Anyway I saw these cute little sourdough boule, which is basically bread bowl size bread. They cost $.99, so I picked one up. If you check out my Trader Joe’s page, you’ll see it under Jenny’s favorites. Anyway as soon as I saw it, this idea came to my mind. Cheesy goodness and jalapenos. 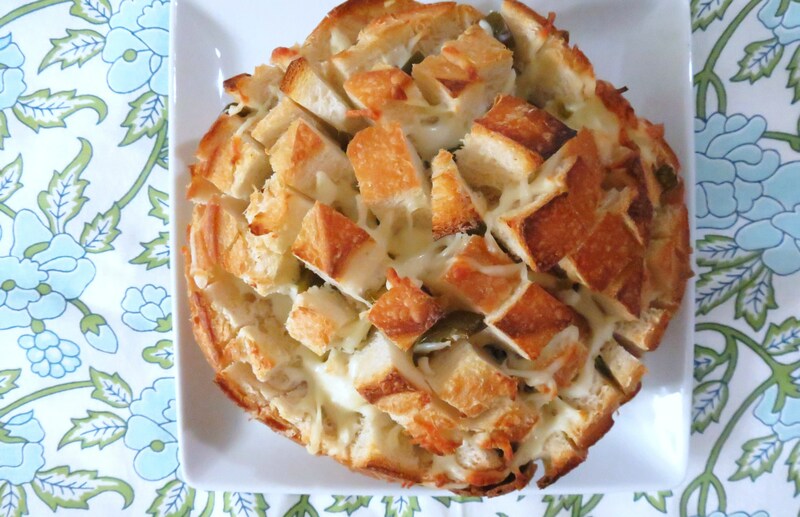 I love, love, love Jalapeno cheese bread. It’s my favorite! First I have to apologize, for the next few days my pictures maybe off. I have haven’t been feeling well, and not only is my body off, so is my eye site. When I went to download my pictures, half of them were cricked (did I spell that right?). For the bread, what I did is cut slices horizontally, almost all way through the bread, then I cut the bread vertically, making little pockets in between the bread. Then I stuffed pickled jalapenos into the slits of the bread. Then I filled the slits with about 1 oz of shredded mozzarella cheese. It kind of looks like a brain doesn’t it? Then I baked it until the cheese melted, which was about 5 minutes and then heavenly goodness came out of the oven. This was so good! It should serve 4 people, but it served 2. If my Husband wasn’t home I would have ate the whole thing! I know bad, but it’s true. 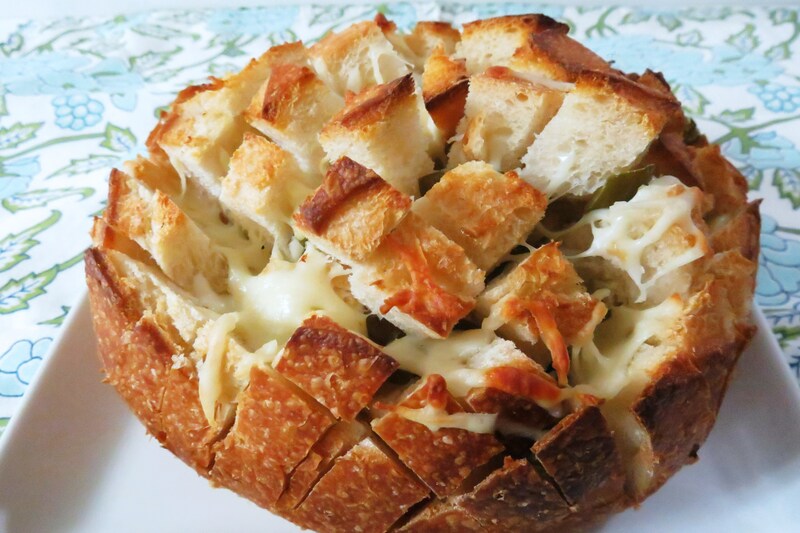 The bread was crispy on the outside, and soft, warm on the inside and lots of gooey cheese everywhere with little pops of jalapeno. This was so darn good!! I will be making this again and again. 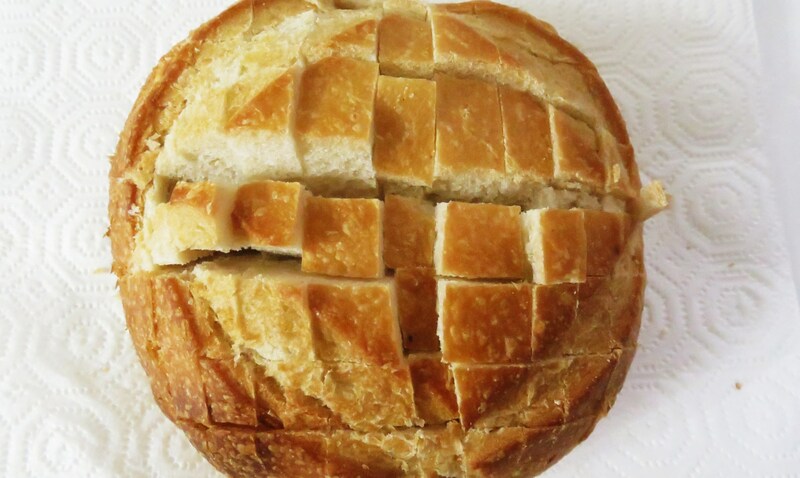 Cut bread bowl horizontally, but don’t cut all the way through, then cut bread vertically, don’t cut all the way through. Stuff the slits with the jalapenos pushing them towards the bottom of the bread. Than stuff the bread with the cheese. 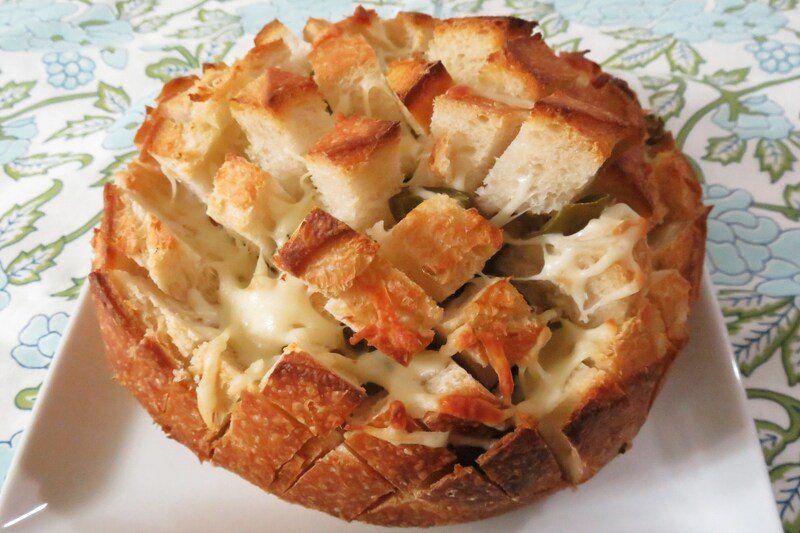 Bake in the oven for about 5 – 8 minutes until cheese is melted. Mmmmm, you know I could sit here all day talk about bread, but I won’t, but I will say this, it’s so simple, easy and fast! You must try it!!! This would also go perfect with pasta dish. You could omit the jalapenos and add basil and sundried tomatoes for a whole different take on this recipe. That would be good too! But my heart really goes to my jalapenos. Mmmm, peppers!! Also, even though sourdough is a white bread, it’s a healthy white bread. According to Probiotic.org, sourdough starter uses the probiotic Lactobacillus strain for fermentation. Therefore, sourdough bread is high in probiotics. Coupled with a probiotic-fortified cheese, sourdough bread is even more effective at providing your body with these important live organisms. There are a ton of other benefits, such as it doesn’t spike your insulin level like white bread. That’s a nice one! I need any excuse to eat more bread! But you know me, I don’t need any excuses!! This looks so delicious! It is hard to believe that is has so little ingredients. 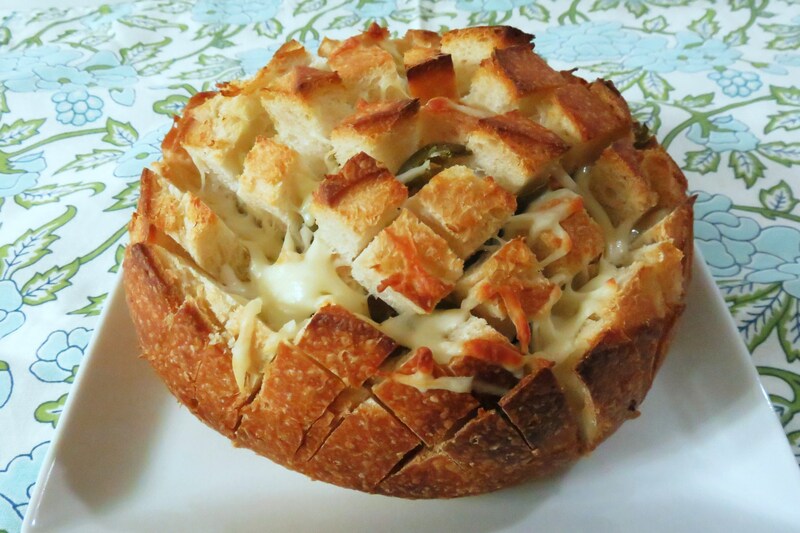 The boule loaf really inspired you. Creative and tasty post! shameful or not, I too would have absolutely ZERO problem eating this whole loaf in one sitting. It sounds amazing! jalapeno and cheese…definitely a perfect pairing. I couldn’t agree with you more! I love jalapenos and cheese, one of my favorite combos!! If I could handle spicy food, I would totally be down for this. I might have to do a little tweaking with the peppers but it looks delicious! Have a great weekend! Hi Cassandra, Oh you could add sundried tomatoes to it instead of peppers and that would be so good!! As you know I find any excuse to add peppers to my meals. What a pretty appetizer – I could get into this BIG TIME! How could you ever stop eating this yummy treat? Now that is the best looking “Brain” I have EVER seen! I have seen this done with green onions, but not jalapenos. We always have an over abudance of jalapenos in the summer, I am printing this as we speak! 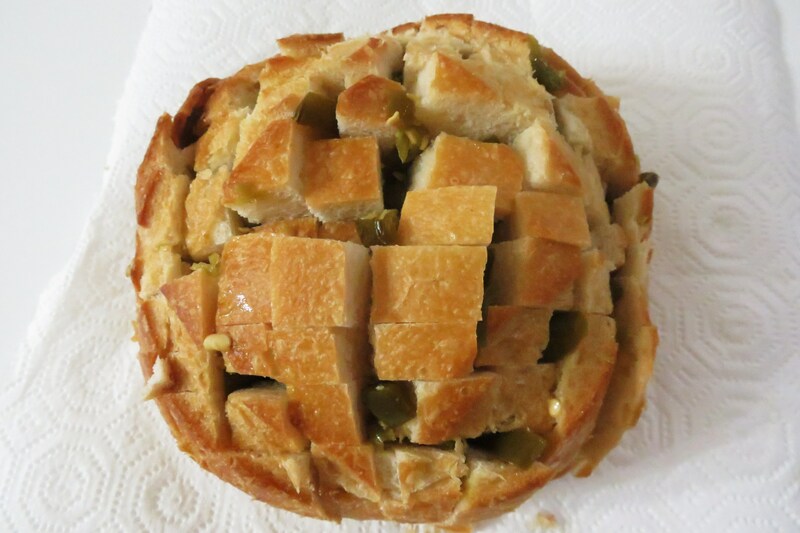 If you try the recipe, let me know what you think! Have a great weekend and thank you for allowing me to link up to your Weekend potluck!! Ahhh your so sweet! Thank you!! Please stop back anytime!! Sourdough is SOOOOO good! I love how easy this is too, thanks for sharing!! 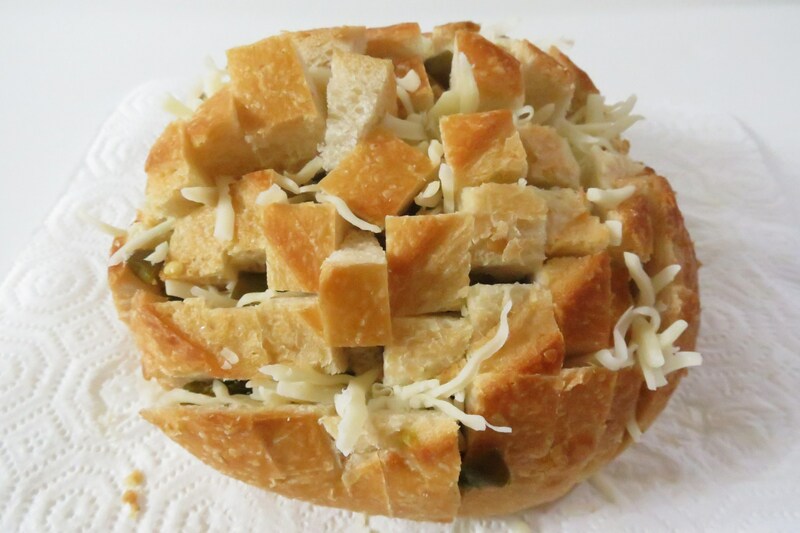 Anytime, you know me I love to share a bread recipe!! Trust me, I could of ate the whole loaf myself, thank goodness my Husband was there to help eat it!! I can’t see a thing wrong with these pictures. They look great and really show off your delicious bread! Oh My! Yum, this sounds so good! I *love* sourdough bread – I must make this to serve alongside tomato soup. That sounds good! I love tomato soup and the bread would be perfect with it! My hubby would love this! Thanks so much! I will thank you for having me!!! I am going to add this to my pot of beans night – looks perfect as is, but knowing me, I will slather butter on it…yuuuum..
Maybe this will get my husband to appreciate jalapenos!!! Thanks! The men in my family (minus my husband) love spicy! !…me too! This bread is amazing! The more cheese and jalapenos the better!! It’s so easy! My Husband and I devoured the whole thing! We couldn’t keep our hands off it!! Hopefully your husband will change his mind! Could you use fresh dice jalapeno’s instead of the pickled jalapeno’s? I just picked some from my daughter’s garden. Hi Hope! I don’t see why not. I think it would be really good. Enjoy!